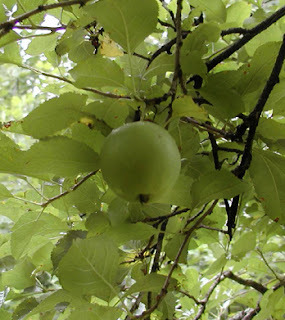 We have perhaps two dozen apples growing in our orchard, out of probably 120+ apple trees. That will be quite the manageable harvest for us orchard newbies! The late frost we endured in April meant no real crop for any of the orchards in our county this year, but we don’t mind that the trees will get a little rest and relaxation this season without having to put all their energy into producing fruit. It gives us time to learn how to treat our apples and other fruit with care. OK, it also gives us time to rest and relax, too! Our little Bay Village peach tree suffered a similar fate; three peaches in sight. Our unpruned grape vines and the raspberries are throwing out an amazing abundance though.